Future, the publisher of SCN, AV Technology, Digital Signage, Pro Sound and other industry publications, has the exclusive rights to produce the official InfoComm Show Dailies and the onsite Show Guide/Directory. Advertising rates and deadlines for the Show Guide and Show Daily are below. Please make your Daily and Show Guide/Directory advertising arrangements directly with Future. You must be a current InfoComm 2019 exhibitor to advertise. Remember: if it’s not Future, it’s not official. SHOW GUIDE - Ranked #2 by Attendees as Most Useful Resource Onsite! Maximize your InfoComm investment and attract more buyers to your booth. Take advantage of the Official InfoComm Daily, the best way to reach attendees during the show. Put your brand in InfoComm attedee's hands with an ad in the official InfoComm Show Daily, produced by Future . Email Adam Goldstein or call +1.212.378.0465 to reserve your advertising space. AVIXA, the Audiovisual and Integrated Experience Association and producer of InfoComm, and Future U.S., publisher of the Official InfoComm Show Daily as well as Systems Contractor News and AV Technology, are creating a new joint publication—Xperience. Xperience will cover the forward-thinking people and sessions appearing at InfoComm 2019 in Orlando, FL on June 8-14, as well as showcasing some of category-defining technology solutions that will be on display. 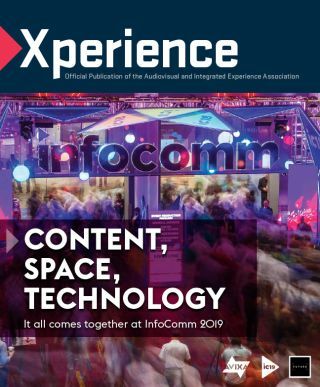 This pre-InfoComm 2019 publication will be delivered to AVIXA and Future U.S.’s combined lists of 100,000+ AV integrators, consultants, content creators, and end users in hospitality, retail, corporate enterprise, and higher education as they are making their InfoComm 2019 plans. For information on advertising in the inaugural edition, contact Adam Goldstein at adam.goldstein@futurenet.com. Future U.S. is the ONLY Publication Partner of InfoComm 2019. Unauthorized companies such as Source Group, the publisher of Communications Daily News, solicit our exhibitors' participation in other “daily newspapers.” These companies are not sanctioned by InfoComm and do not have distribution rights at the show or key venues like the Orange County Convention Center or official InfoComm hotels. In fact, some of these organizations do not even print their publication. InfoComm has no recourse over advertising purchased from these companies.